Carpet develops wrinkles & buckles for a variety of reasons. Common ones include improper installation, cushion failure, carpet delamination / defect, and temperature fluctuations (seasonal residents / vacant homes). The cause can be hard to pinpoint and the problem can reoccur. 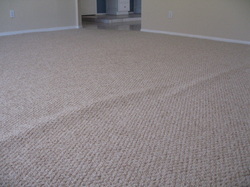 Most carpet can be effectively re-stretched to remove wrinkles. If the wrinkles have existed for some time, even after being stretched out they may still be visible because the surface has worn differently or a permanent crease has formed. It is best to have wrinkles & buckles addressed promptly to ensure best results.